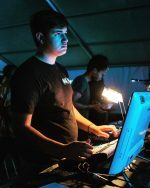 I am a lighting technician who is very good with technology and I know my way around computers and lighting control desks. I also have experience in sound engineering and mixing. I have been a lighting technician for 5 years and have had many hours of experience.